Partition on hard drive, SD card, flash drive or external HDD become RAW and cannot access files? Here is an easy and safe solution to help you perform RAW partition recovery and get back lost data quickly. 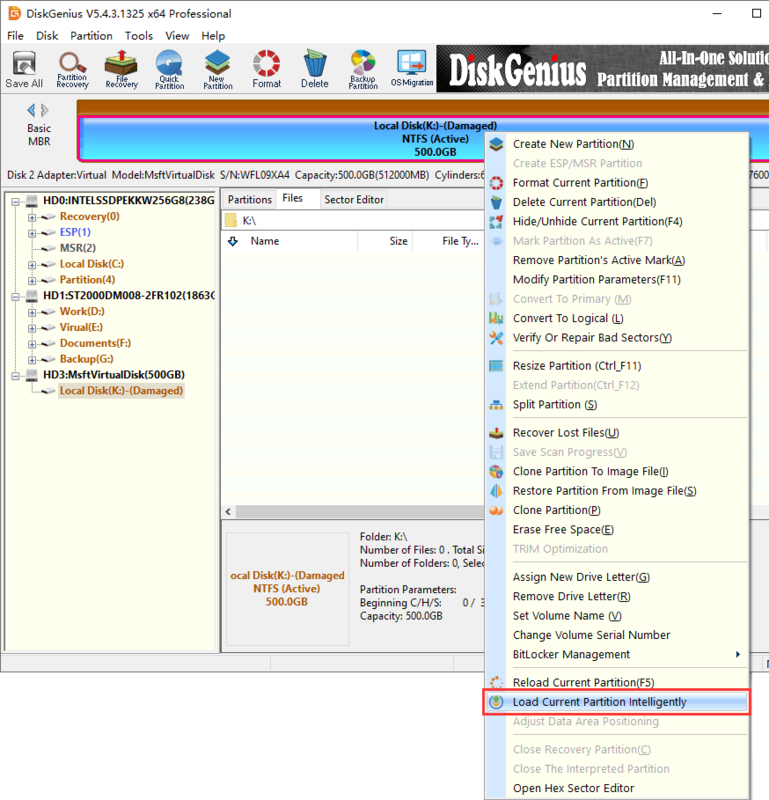 Why does disk partition become RAW file system? A partition is a section of hard drive, which can be used to store data. A hard drive can be divided into one or more partitions to organize data. When you partition a hard drive, you can select filesystem for partition such as NTFS, FAT32, exFAT, etc. 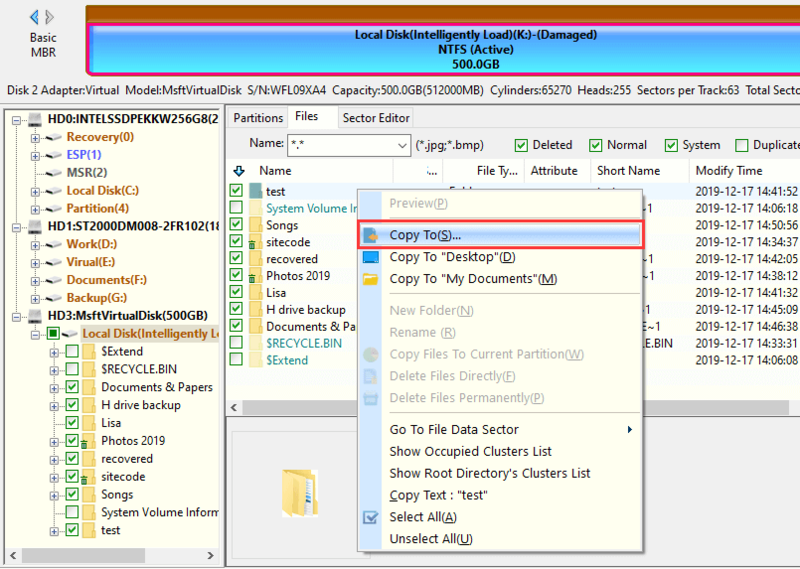 In Windows, NTFS is the default file system on hard drive, and FAT for removable disks. However, during the process of using storage device, partition may become RAW file system. RAW drive issue can happen to various devices such as hard disk, SD card, external hard drive, USB flash drive, etc. A RAW drive means the file system of the partition is RAW and it cannot be recognized by operating system. Thus Windows cannot access and mount the partition properly. The RAW partition reports error message when you try to open it. If you check its status in Disk Management, the RAW drive is displayed as RAW, unallocated or uninitialized. Most often, RAW partition is the result of logical data corruption. All data on the corrupt partition seems to be lost and you won't be able to repair it by assigning a drive letter. Partition can be regarded as a container of data, and the file system is the manager which is responsible for managing data. When the manager is corrupted or missing, operating system get nowhere to know where the partition is located and how files are stored. Thus we cannot access the drive anymore. Fortunately, RAW partition recovery is available and it can be done many partition recovery applications. If the RAW drive contains important files for you and you can retrieve these files with the help of partition recovery software. When files are recovered successfully, you can format the RAW partition to get it repaired. When you attempt to open the drive in File Explorer, a message would appear saying "Disk is not formatted. The disk in drive G is not formatted. Do you want to format it now?" You need to format the disk in drive J: before you can use it. Do you want to format it? H:\ is not accessible. The parameter is incorrect. If you run chkdsk for RAW drive, you will receive the error message: The type of the file system is RAW. Chkdsk is not available for RAW drives or Convert is not available for RAW drives, chkdsk reports RAW file system. Location is not available. G:\ is not accessible. The volume does not contain a recognized file system. Please make sure that all required file system drivers are loaded and that the volume is not corrupted. Location is not available. H:\ is not accessible. The file or directory is corrupted and unreadable. If you check properties for the drive, you can see the file system is RAW. In some cases, the free space is showing 0 byte in size. Note: Do NOT format RAW partition even though Windows asks you to do so. Formatting will cause further damage to RAW drive and adds difficulty for RAW partition recovery. Read-only recovery process: the entire recovery process is read-only, which does not affect original data or devices. Partition recovery: it supports recovering deleted partition, restore lost partition, and retrieve files from formatted or corrupted partitions. File recovery: Get back deleted or formatted files from local disk as well as removable devices. File systems: support file recovery and partition recovery from NTFS/FAT/exFAT/Ext2/Ext3/Ext4 disks. Hex editor: advanced users can recover lost files or partition manually via editing hex raw data on disk. File preview: it allows users to preview various files (photos, MS office files, PDF, video, audio and Text files) to help check if files are correct. WinPE bootable disk: it supports creating Windows PE bootable disk which can be used to recover data when system cannot boot. Connect the disk that contains RAW partition to computer and make sure you can see the drive in either File Explorer or Disk Management. Formatting or running chkdsk command for RAW drive is of no help in RAW partition recovery, thus you should ignore error messages that Windows prompts to format it. 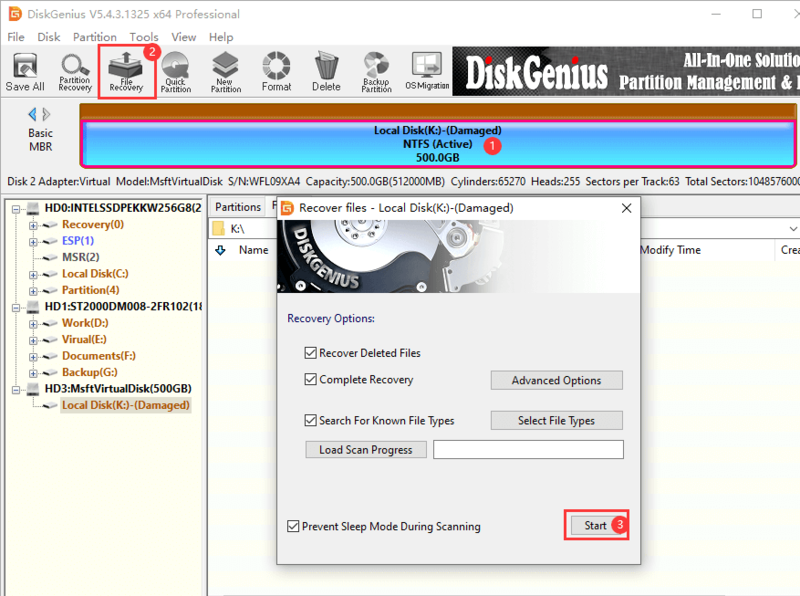 Download and install DiskGenius on your computer and you can follow steps below to recover RAW drive. Step 1 Launch DiskGenius and you can see the RAW drive from the main interface. Step 2 Select the drive from the drive directory on the left pane and click File tab on the right pane, and check files in the RAW partition can be displayed directory. 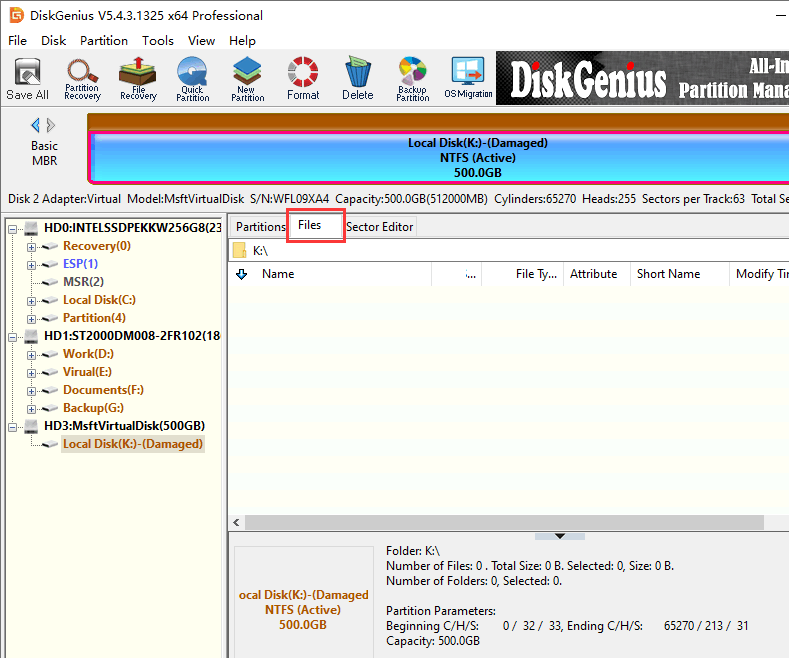 In some cases, files and folders in RAW drive can be listed by DiskGenius with doing any scanning. If you can see your files, you can copy files to a different drive and get data recovered. If files cannot be displayed in this way, you should move to following steps. If the RAW drive was NTFS format before it got corrupted, you can also try this: select the RAW drive and select "Load Current Partition Intelligently" option from Tools menu. This feature is designed to the recovery of NTFS partition whose $MFT is damaged not that badly. If this feature works, you can view all files in RAW drive within a couple of seconds. Then you can copy all files you need to a different drive. Step 3 Right-click on the RAW drive and select "Recover Lost Files" option from context menu. This opens the file recovery window. Step 4 Select recovery mode Complete Recovery and click Start button to search recoverable files from RAW partition. If you want to try recovering files deleted before the drive got corrupted, you can select option "Recover Deleted Files". This recovery mode will scan and analyze sectors tagged as Free by system, so that deleted files can be found and recovered. If the RAW drive is damaged quite badly, for example, you performed chkdsk or formatting on it, the option "Search For Known File Type" should be selected. This option is able to recover files even when file directory of partition is totally destroyed. Thus you can find more recoverable file with this option selected. Step 5 Preview files during or after scanning to check whether files can be recovered correctly. 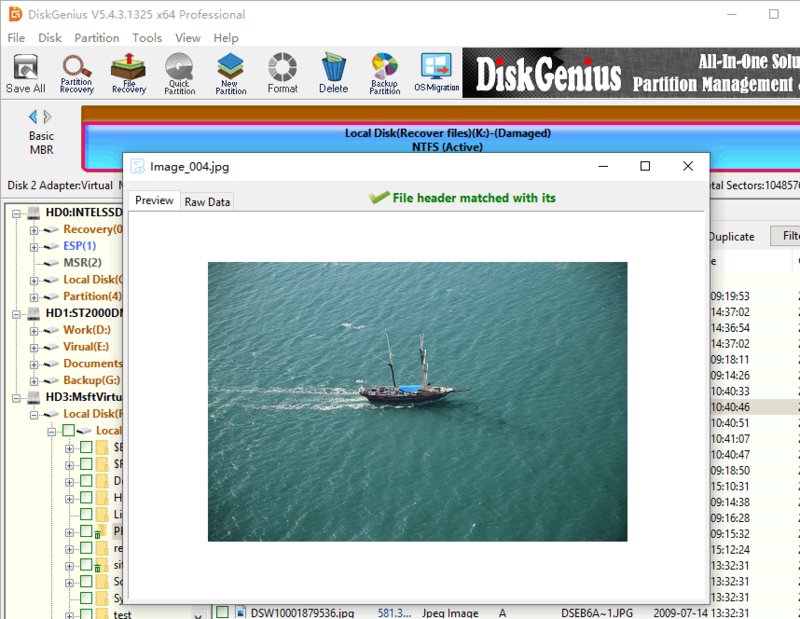 DiskGenius supports preview various types of files, including photos, documents (MS Office files, PDF file, TEXT files, etc. ), audio and video files. File preview helps to judge if the file is correct and whether it is damaged. Select a file and you can view the file in thumb and hex data in the lower pane; right-click a file and select "Preview" or double-click a file, and you can view the file content in a previewing window which shows file content in its original size. Step 6 Copy files to a different drive and get files recovered. Select files and folders you want to restore from the RAW partition, and right-click on them to select "Copy To". Then you'll be asked to select a location to save these files. You should select or create a folder on a different disk instead of the RAW drive and save recovered files. Tip: If you are advanced user, you can try RAW partition recovery manually with the help of Sector Editor. With the help of editing hex data, you can repair damaged MFT or DBR to fix corrupt partition, which enables you to recover files from the disk directly without copying data to a different drive. RAW file system means the drive is not formatted and there is not correct file system on it. Reasons why a partition becomes can be various. Now we sum up the common reasons that could lead to the issue. Disk drive cable issue: It rare circumstances, the RAW drive can be caused by loose or broken cables. For example, the USB cable connecting external hard drive and computer is broken or loose; there will be something wrong during the data transfer and then lead to RAW partition. Improper shutdown: A sudden power cut such as improper system shutdown while hard drive or other storage media is working threats data security. File system is likely to get damaged during the process and hence result in RAW partition. Error while changing file system: Since different operating system uses different file system types, many users want to change file system format so that the drive can be used under multiple platforms. Some third-party software is able to change file system without formatting drive, but once error occurs during the converting process, the partition may turn to RAW and inaccessible. Improper operations: Many users do not click the "Safely Remove Hardware and Eject Media" icon before disconnect USB flash drive, SD card or external hard drive. This is not a good habit, as it is one of the major causes of RAW drive. Files system structural damage: As has mentioned above, RAW drive is the result of corrupt or incorrect file system. Thus if file system structural gets damaged, the drive will turn to RAW. Virus attack: Virus and malware are widespread throughout the Internet, which accounts for many undesired issues like data loss, system crash, data damage, etc. Virus is destructive software which is able to infect all kinds of storage devices and corrupts file system. The affected drive might be RAW or gets encrypted due to virus. Therefore, users should install anti-virus software and scan computer regularly. This instruction explains RAW file system and RAW drive and tells how to recover data from RAW partition. There are a number of causes leading to RAW partition, but you can easily carry out RAW partition recovery with the help of partition recovery software. However, it is still recommended to back up data in regular basis to avoid data loss issue. Hope you'll be able to do RAW drive recovery after reading this tutorial. If you feel this article useful, please share it to help more people.